The Auto Scents Wipe Out Odor Eliminator System vaporizes, decontaminates, disinfects and deodorizes. Truly a revolutionary, innovative product. Gets rid of odors any enclosed or confined environment. It can change the cabin air quality by safely penetrating any material. It completely decontaminates and deodorizes. 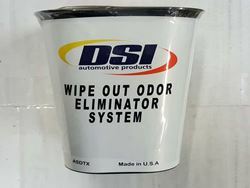 WIPE OUT ODOR ELIMINATOR works in automobiles, RV's, boats, schools, hospitals, hotels, apartments, restaurants, bathrooms, public transportation and any other public or private facility.